Thanks to a Windsor non-profit organization, veterans with disabilities in Colorado are embarking on a new mission. Trident Veteran Adaptive Programs, or TVAP, works with these veterans to improve their abilities and take the focus off of their disabilities. 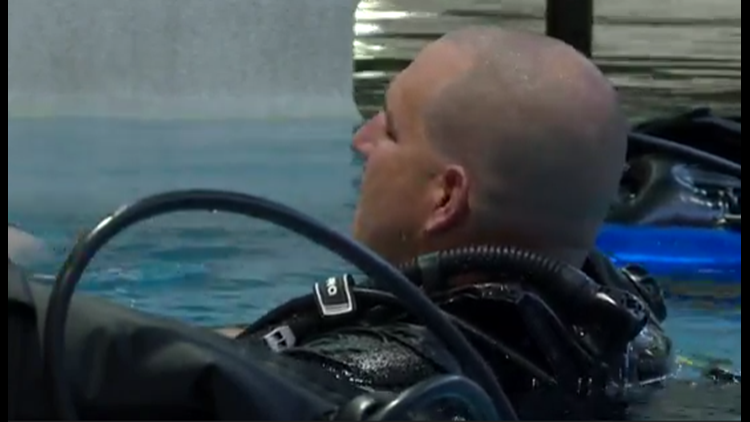 But to get their help, these vets have to go underwater. THORNTON — When you're in the water, you feel weightless. That's exactly how people with light personalities like Desiree Emillio-Duverge deal with their heavy realities. Emillio-Duverge is a veteran of the Cold War. "I witnessed the Berlin Wall physically coming down in front of my eyes," she said. While stationed in Germany, she contracted a respiratory disease which left her paralyzed and in wheel chair. She said with her difficult situation, she saw no hope. But Scott Romme with Trident Veterans Adaptive Programs did see hope for her and knew exactly how to help. TVAP teaches veterans with various disabilities to scuba dive whether or not they have experience. "The program is designed to introduce or reintroduce veterans to the aquatic environment," Romme said. However, it does more than just get the veterans back into the water. It also helps them overcome mental and emotional challenges. "Desiree before this was not confident and strong," Emillio-Duverge said. "I lived a life in fear." Now the woman was once bound by her wheelchair has been set free by the water. "I'm unstoppable," she said. "Yeah I'm paralyzed, but I'm doing more now than when I could walk." TVAP has been helping disabled veterans for nearly 30 years now. To learn more about the non-profit, click here.